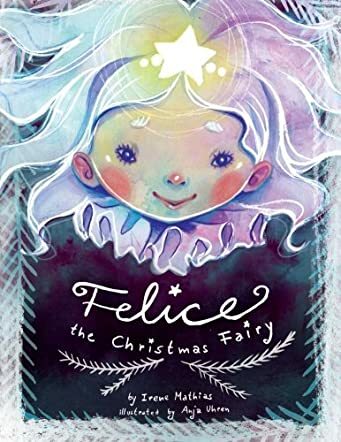 Felice the Christmas Fairy by Irene Mathias, with full-color illustrations by Anja Uhren, is a wonderful story for young children (and adults who are children at heart.) Told in jaunty rhyme and accompanied by luscious artwork, it tells about Felice, a Christmas tree-topper fairy who falls off the tree one day. The other ornaments help her get back to the top before the cat can carry her off, but she’s been damaged and needs some help from Santa to bring the magic back. That help comes in the form of “tough love” for Becky, a very spoiled little girl who makes Christmas anything but merry for her mother. In this touching story about the magic of Christmas, Felice learns about the beauty of friendship, while Becky learns about the joy of giving to others. In Felice the Christmas Fairy, Mathias presents a timeless story. Felice is as likable as a Christmas fairy should be. Spoiled Becky is certainly deserving of coal. Both struggled with disappointment. Felice might have submitted to the inevitability of being carried off by the cat. She didn’t. But neither did she satisfy herself with simply getting back to the top of the tree. Her fall, which was a tragedy, let her see a whole new world and to meet ornaments she otherwise never would have met. Likewise, spoiled Becky might have given up on Christmas altogether when she didn’t find anything she expected under the tree. It was certainly a tragic Christmas for her that year. But she didn’t. She listened, she learned, and she became a better person for it. An entertaining and engaging story. A gorgeous book. Highly recommended.